What a fun day! It was opening day for the brand new water park. The three oldest kids were at school still so we took the three little ones over to check it out! They absolutely loved it and Cassie definitely enjoys the water! 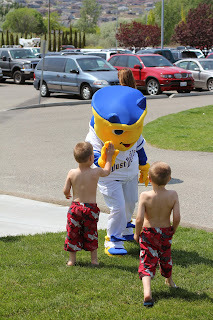 This picture is of the boys meeting Dusty the Dust Devil!